Our scripture this morning is taken from Exodus 3, verses 13-15. We will meet this scripture in the body of the sermon. I have a riddle for you: How is a church like a river? you cannot attend the same church twice. As I look out at you, my friends and family in this church, I recall the last time I enjoyed this opportunity ... a decade ago. There were different faces, and some of the same faces. We’ve enjoyed several pastors since that time, and our campus, well-used by us and the community, has certainly changed for the better, thanks to the hard work and generosity of the congregation. And now we welcome The New Church. Now Sunday School teachers and vacationing congregants can enjoy watching the entire service. And all of us can avail ourselves of the sermon library. And some things do remain, albeit with a mix of longstanding and newcomer members: individual contributions of time and creativity, and multiple hours of hard work in the committees of the church; overflowing fellowship tables, a cookbook, dinners, dramas; lay sermons; our Music Minister who, along with our choir, continues to bathe us each week with music he selects to enhance our worship experience; our parents who attend and continue to bring their kids to church and Sunday School, thus making church attendance a priority in their family’s life. In the old days, schools taught character. Nowadays, it’s up to families, including this church family, to teach character ... by our lessons and by our actions. And Community Church continues to be a church which encourages me to study, pray and work out my own understandings based on that study, and continues to be a church family that fosters free discourse of matters both spiritual and personal. A church not of dogma, but of study and relationships. A church that has given me a bible study group for the past decade that has encouraged me in my spiritual path. This church and this church family are major players in passing on our culture, our civilization. I’m glad I jumped into this river ... come on in, the water’s fine! On the larger scale, as we study some portion of the scriptures each week, we learn the changes that have come about in theology since Abraham, and what has remained the same. As I prepared this sermon, I learned our grasp on what God is also keeps changing. Thanks to the Deacons for giving me the opportunity and challenge to delve into a prayer I’ve said since childhood – the Lord’s Prayer – a prayer we say here in church and Sunday School regularly, the prayer our children led us in this morning. I remember my grandmother rewarding me with fifty cents when I recited the prayer. Do you have memories of learning the prayer as a child? My studies led me to numerous writers, including our pastor. I found the topic to be far more expansive and complex than I had foreseen. By happenstance, I stumbled upon books in our library on this topic that fostered some of this sermon. One led me to a bible passage that made no sense to me, which headed off in another direction. I took the hint when I found my dog Duncan had eaten that portion of my bible. I focused on the first phrase of the prayer and looked at the underlying concepts over four thousand years of development. I was curious to uncover whether God is changing ... or is our view of God changing as God remains in relationship with us? That is, do the multiple characterizations of God derive from our ongoing and differing interactions with God? I entitled this sermon “What do you call God?” I know this congregation seeks each day to discover God’s will for our lives, so I know that when I ask “What do you call God?” your answer is not “Mercedes,” or financial wealth, or thinness, or youth, or possessions, or athletic success. I know we are on the same page in thinking about God. Clearly this task is beyond my skills. The exercise uncovers for me the immaturity of my theology, and in particular, my inability to understand the doctrine of the trinity. The diversity of opinions I encountered in my reading regarding the meaning of verses bolsters my confidence that I, too, can read the bible and seek its wisdom. As can you. Our experience counts! And it is a journey. I invite you to join me in thinking about the names of God and how we refer to God. I offer these words in the hope they will stimulate discussion, thought and prayer. And provoke discussion. And I will endeavor to be wise enough to learn from your rebuttals to what I say. How can anyone deliver a quality, well-reasoned and thoughtful sermon each week? And secondly, the history of how we address God and the names we use or do not use for God demonstrate how our relationship and our interaction with God, and thus our understanding of God, have changed over the centuries. A word on metaphors: Literalist that I am, I struggle to find the metaphorical meanings in the bible, aware that metaphors are always inaccurate ... for Heisenberg taught us we cannot measure and describe without changing the original. And yet language is a poor vessel to contain the truth. Further, from the Arian controversy through St. Augustine and Martin Luther, theology keeps changing, like that river. I will touch on some recent challenges to our long-held attitudes. Now, on to the Lord’s Prayer. Jesus begins by addressing God, then goes on to refer to God’s name. Later, the Jews began using the phrase “ADONAI,” meaning Lord, and avoided saying God’s name out of reverence. Orthodox Jews to this day avoid writing God’s name in a place where it may be discarded or erased. The seven names of God that, once written, cannot be erased because of their holiness are the Tetragrammaton, El, Elohim, Eloah, Elohai, El Shaddai and Tzevaot. But there’s more. Jesus addresses God as “OUR FATHER.” Are there other phrases of address in the bible we can examine to find clues about God. Yes ... and this is where my study got interesting. One of my references speaks about God being in relation to man. The analysis is that God is always emerging in new ways in response to the requirements of the relationship at hand. The writer talks about God ... Yahweh ... as a party to a dialogue, an exchange that never reaches closure. Taking that thought, let’s look at some of the phrases – metaphors – used for God in the Old and New Testaments: shepherd, father, mother, redeemer, judge, deliverer, friend, helper, rock, shield, fortress, hope, glory, strength, hiding place ... and consuming fire. Ah, this list could go on and on. This God we worship does indeed manifest his nature by his actions in relationship. Note I used the male pronoun. Consider also the use of “OUR” Father. It is inclusive. Not only does the prayer draw a circle that takes us in – that is, all folks – it says we are adopted by God. And the use of the phrase “Abba” leads us to approach God with the tenderness and love a child approaches a parent, and, perhaps most importantly, invites us to embrace a God who loves us, who nurtures us, who cares for us ... as a father does his child. 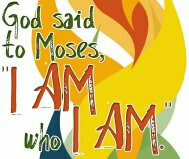 God gave Moses his name ... a name that references God defined by action. In the Old and New Testaments, metaphors are used to describe God by describing his actions. We are left with looking at God’s actions. Our words of address are so limiting, we must not allow our views, our opinions, our relationship with God be caged by our words. One of the books I found in our library challenged me to confront what I find uncomfortable: Is it okay to call God “Mother”? The author, Paul Smith, explains that for some, the use of “Father” or “Abba,” connoting a male, is not helpful and, for some, is alienating. For some, a gender-inclusive bible is the answer. For some, the use of “Father” and male pronouns for God implies a hierarchical, male-dominated relationship with God that is antithetical to the God of love and nurturance. For others, the use of the word “Father” conjures up images of the unloving, remote, uncaring father of their childhood. Wow. I quickly found myself way over my head, reading theologians’ arguments regarding God’s gender. I followed this path into a veritable garden of writings and essays. May I share with you some of the “wisdom” I encountered? Some theologians point to God’s use of the pronoun “I” in the prayer and elsewhere, and say that God is without gender. Yet another theologian reports there is not a single passage in the Bible which claims that God is neither male nor female. He argues that if God were neither male nor female, God would therefore be sexless and the entire bible and its revelation of God would be fundamentally different. God absolutely reveals himself in scripture in a masculine context. One of the library books contained discussions of Genesis 1:27: “So God created mankind in his own image, in the image of God he created them; male and female he created them.” However, each commentator reached a different conclusion as to what this verse suggests. By the way, that’s the verse my dog ate. And recently, Jonathan Gamble’s sermon and a study of Proverbs, particularly Proverbs 8, challenge me to rethink this whole gender issue. Maybe in another decade I will share with you what I found. The debate sets up a false dichotomy. That is, trying to determine God’s gender by looking at his behavior and labeling behavior as either masculine or feminine is wrong. That is, some identify characteristics as feminine, but that presupposes that a characteristic is inherently male or female. If God is male, does this not mean that men are more godlike than women? Doesn’t Paul instruct Christians to be imitators of God? For me, it is uncomfortable to say “Our Mother who art in heaven.” I rebel against it. But I think I can use the discussion to aid me in defining for myself what it means to be a father and to be masculine. Can’t I be nurturing? Can’t I be caring? Can’t I be creative? Can’t I be sensitive? What did I get out of all this? to summarize: action speaks louder than words. I will look around me to see the beauty and joy in the world, in a park, in a child’s smile, in the relationships here in church. I will struggle with the world’s sadness, poverty, and desolation, for we live in a world of rainbows and holocaust, Jericho and a baby’s smile, Job and the healing of the leper. and i will continue to pray to be delivered from evil. Our Father, who art in Heaven, hallowed be thy name. Thy kingdom come, thy will be done, on earth as it is in heaven. Give us this day our daily bread, and forgive us our sins, as we forgive those who sin against us. And lead us not into temptation, but deliver us from evil, for thine is the kingdom, and the power, and the glory, forever and ever. Amen.